We knew Lenovo's ThinkPad Tablet 2 was coming, we just didn't know when. Lenovo announced Wednesday we can expect to the see the Windows 8 tablet in October, though no word on an exact release date. "Today we are excited to reveal the fruit of this collaborative co-engineering, the ThinkPad Tablet 2, a joint effort between Lenovo, Microsoft and Intel," Dilip Bhatia, vice president and general manager, ThinkPad Business Unit, said in a press release. 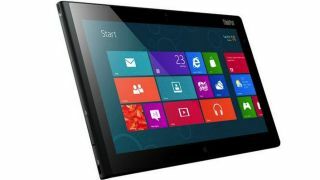 Weighing 1.3 pounds and measuring 9.8mm thin, the tablet will run Microsoft's Windows 8 and an Intel Atom processor. It looks like this tab will replace the ThinkPad Tablet, too. TechRadar revealed leaked specs for the ThinkPad Tablet 2 last Wednesday, but now we have confirmation for many of them from Lenovo itself. Both 3G "pay-as-you-go" plans and 4G models will be available. A 10.1-inch screen, HD display, front and rear-facing cameras, HDMI port and wireless video streaming are but a few of the features Lenovo's boasting about in its new tab. Oh, and an optional digitizer, stylus pen for "precision input" and a fingerprint reader for security. Stateside, the ThinkPad 2 will be available on AT&T's LTE network. No word yet on how much it'll cost, though. Lenovo said the tablet will launch when Windows 8 starts shipping, which Microsoft has said is Oct. 26. Microsoft's Sufrace tablet is also slated to arrive that day. Lenovo didn't go so far as to say that's the date, but you might want to mark your calendars.